GMO- What's the real scoop? I hope you are having a good holiday and that is well across the "helpful gardener forum family". I have another question (imagine that). I couldn't determine if this would be the best place to start the thread, but it seemed close because it's a GMO question, and we are dealing with GMO and NON-GMO seeds here. I also know the horrible stories of things that have happened like Monsanto and the Soybeans, and all the other crops that are resistant to round up, and how they are suing people that got crossed pollinated, and you aren't allowed to collect seeds. I also know that they are using cutting edge technology to modify plant genes to produce results that were not possible in nature (at least I think that's right, I'm not 100% sure that statement is correct). But it's also important to point out that "artificial selection" where certain plants that have certain qualities are simply removed from the original crop, and placed together, allowed to reproduce and hopefully will have future generations with that trait they were looking for. ... that's been happening since like.. uh since we started cultivating plants thousands of years ago. So is there some kind of way that they differentiate that kind of seeds from other seeds that weren't actually scientifically altered, because that technically is genetic modification. You aren't doing it in a lab, but it is how things work. (if you don't believe me go look up the history of Dogs...humans are responsible for the dog breeds that exist on earth. it was artificial selection...the wolves adapted and the humans removed the really aggressive ones, and over time (a long time) different breeds of dogs came to be), so is there some way one can tell the difference between "monsanto mad scientist" seeds, and say a family that has been cultivating roses for 500 years and has awesome roses? I am not sure if I am asking this question well, and I don't know if maybe I am a total idiot for asking it, if there is some obvious answer that I don't know about, but every time I go to research this topic, it is usually a bunch of information that in no way satisfies my curiosity. I need to hear a little less of "GMO Is horrible, they are killing us" and more like "this is exactly what they are doing" because I am very unclear on this subject. I know for 100% certain though when I was a child, I was one of the largest children in my high school. I am 6'3" 220lbs and I was "big" compared to the other kids. I also remember that the girls in my school started to develop around the 9th and 10th grade years. I happened to be at a "middle school" (we called it jr. high) the other day for a consultation on web marketing and I noticed that the girls in the hallways looked like they were full grown women! I am sorry but they didn't look like that when I was in Jr. High, I remember this very clearly. Obviously SOMETHING is in the food here in the US, it's more than apparent. The reason I ask is that if you go and look for seeds, like "VATES Collards" and they claim they are NON-GMO.. VATES is the Virgina Truck Experiment Station (1900's)... those greens were cross bred (artificial selection) by that research company....so what gives? How much of this is just a marketing thing, and how much is real? Re: GMO- What's the real scoop? There are many websites that have made millions of dollars pandering to anti-Monsanto sentiments via Facebook and other social media. I am not exaggerating. Millions of dollars. Buzzfeed, Huffington Post are on the top tier. On the lower level are non-authoritative websites that promote Dr. Oz type remedies that also publish anti-Monsanto articles, some of which make dubious claims, for profit. This in turn has made it difficult to obtain accurate information. Unfortunately, this has become a political topic, not unlike Global Warming. The real scoop is that most people are afraid of GMO without understanding what it is and what it does. From the beginning man has altered his environment. The first humans collected wild wheat as they foraged and followed the herds of prey. When they settled down in more permanent villages, towns and cities, they could no longer depend on what could be foraged, so they selected varieties of wheat and planted the wheat with the qualities they liked. It was the beginning of selective breeding. Over thousands of years of cultivation and through refinements in selective breeding wheat produces more grain, but the cultivated wheat of today has become dependent on man for germination, it can no longer grow wild. Tomatoes have been selectively bred to be red, round, and for long shelf life, often at the expense of flavor. Brandywine, one of my favorite heirlooms will probably never show up in my local market as it does not keep or store well. I have grown it but I have to grow it in containers off the ground since it may not have nematode resistance and I need to spray it regularly since it has very poor fungal resistance. The best tasting tomatoes that I have found had green shoulders, were squat and lobed rather than round and were off color. The non-genetically modified tomatoes that have been bred for disease resistance often have sacrificed taste or texture for it. Papaya ringspot virus (PRSV) nearly wiped out the papaya industry in Puna. PRSV had struck earlier on Oahu and the industry relocated to Puna. The University of Hawaii and Monsanto developed SunUp the first GMO papaya with red flesh (strawberry papaya) and a sweet taste. It was created by inserting an inactivated piece of the virus into the papaya seed with a gene gun. Essentially, the papaya seed was put in a box and a pistol loaded with the genetic material was shot into the seed mechanically introducing the seed into the embryo. SunUp papaya could be grown next to an infected field and remain unaffected. The genetic modification allowed the papaya to coat the virus and prevent it from activating it, much the same way people get vaccinated against smallpox or measles. SunUp was crossed back to a non-GMO Kapoho papaya to produce Rainbow, a yellow fleshed GMO variety. Sun Up has better PRSV resistance, but Rainbow has better aesthetic qualities even though the tree may still express PRSV on the side shoots. Today Sun Up is rarely grown, but 90% of the market papaya are GMO. There are other GMO varieties that have been produced and since the gene can be transmitted through cross breeding, it has become widespread. If you have a healthy papaya next to one that has PRSV, it probably has the gene. There is a test available to test if a papaya is GMO. Here is the kicker, if you ask most lay people who eat papaya they will tell you they don't eat GMO, they eat Rainbow. GMO papaya do not look or taste any different from any other papaya. Japan who had resisted GMO papaya for over 25 years, has relented that there have been no documented ill effects from anyone eating GMO papaya, and now finally does allow GMO papaya to be imported. Many of the Asian countries are now facing the same problems with PRSV destroying their crops so they are looking for salvation in technology as well. The one thing I do think is that people should have a choice, even if that choice is based on misinformation. The markets here are required to separate the papaya and label what they are i.e. Rainbow, Kahuku, Kapoho, Kamiya, etc. They are not required to label them as GMO or not. Neither is the wheat, soy, cannola, corn, tomato or any other product or ingredient that is labeled. Unless you buy everything organic, almost all of the animal feed is GMO, wheat products flour, bread, pastries, soups, are probably made with GMO wheat. People who claim that GMO isn't safe aren't even sure what the GMO modification was, and those that claim more testing is needed are misinformed. GMO foods have been under scrutiny from the start and are so pervasive that if there were any ill effects, it would have shown up by now. What was probably not foreseen was the accidental natural crosses that occur by wind, animal, or insects. Since the GMO plants don't look any different than "normal" plants, you can't tell by looking at it and if they are superior, they become the dominant species through natural selection. GMO allows the selection of a specific trait to be inserted into an organism. It is less hit and miss than selective breeding and the end result can be accomplished in less time. Since a specific trait is selected, other traits that may be less desirable can be left out. Selective breeding, has less control of what traits are being bred as GMO. Through selective breeding it will take many generations and since individual traits cannot be controlled there will be a lot of variation. Selective breeding may eventually breed in a desirable trait, but may in the process breed in undesirable traits as well. Selecting for a specific trait by inbreeding lines, also amplifies the defects as well. Many of the large breed dogs have hip dysplasia and 50% of white cats with blue eyes are deaf, all because humans selected traits that they desired, but not necessarily traits that nature would have chosen. As far as DNA is concerned all living things are made up of the same chemicals. Just in a different order. So genes from a plant is no different from an animal. In selective breeding, you are limited by what is possible to be bred together. Some pairings are possible but the result are mules, which are sterile and unable to reproduce. Even within the same plant family there may be differences in chromosome pairing which make some combinations impossible to breed them naturally. The only practical way to introduce a gene into a line that does not naturally breed would be through gene splicing. Above is only part of the story. "GMO" covers a lot of ground and blanket approval or condemnation of it makes no sense. To have any real opinion, you need to ask what organism is being modified in what way for what purpose. Some of these we might approve of and some not. But of course we don't get to ask those questions, since foods are not labeled (in this country) and no information is given. But genetic modification in the laboratory with advanced gene splicing techniques is NOT the same as selective breeding. Genes can be inserted, that could never naturally arise in that plant, no matter how many millennia of selective breeding you did. And we don't know what the consequences of that are. We are blandly reassured by the companies that are making billions in profits off this, that it is perfectly safe. I don't know that if that is true or not, but the point is that no one else does either, because the real studies have not been done. Because Monsanto and other companies say it is safe does not reassure me. We have seen many, many examples of unintended consequences in the past. We do know that genes do not act in isolation, genes and their products interact and influence each other and operated in complex and multi-functional ways. So it is quite plausible that a gene inserted for one purpose, ends up having other, more subtle influences. The blue line in this graph is RoundUp use. Note the red line, which is number of different types of confirmed RoundUp resistant weeds (aka "super weeds"). One of the many impacts of so much use / over-use of RoundUp is that the weeds it is supposed to be targeting become resistant to it. RoundUp ready plants were originally marketed as reducing the use of herbicidal poisons. In fact, it has been quite the opposite. 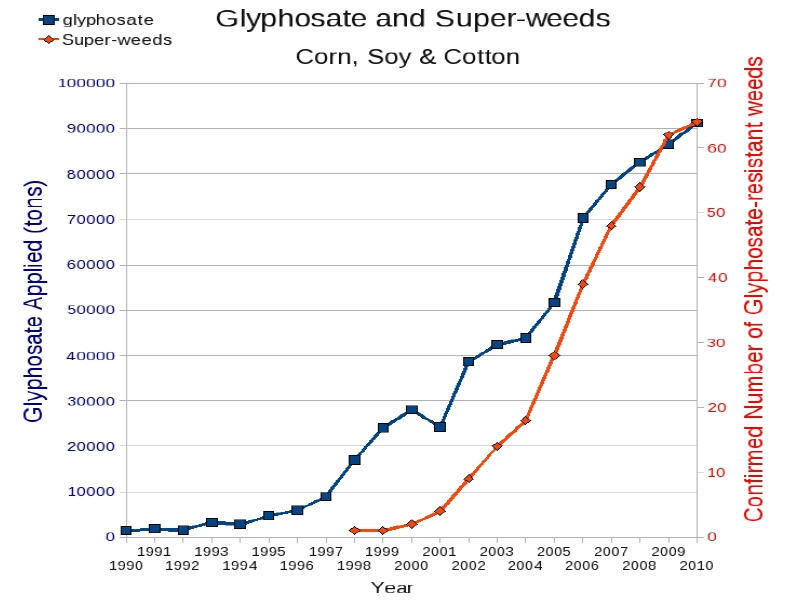 Not only has use of RoundUp skyrocketed, but as more and more weeds become RoundUp resistant, growers are using multiple herbicides, more toxic herbicides. "Growing reliance on older, higher-risk herbicides for management of resistant weeds on HT crop acres is now inevitable in the foreseeable future and will markedly deepen the environmental and public health footprint of weed management on over 100 million acres of U.S. cropland." Charles Benbrook, "Impacts of Genetically Engineered Crops on Pesticide Use: The First Thirteen Years" and Supplemental Tables, The Organic Center, 2009. So those super weeds are actually resistant to glyphosate and the plant diseases it promotes. Agribusiness first response is to pour on more and more RoundUp As US farmers drench more than 135 million acres of Roundup Ready crops with Roundup, plant diseases are enjoying an unprecedented explosion across Americaâ€™s most productive crop lands. Monsanto used to boast that Roundup is biodegradable, claiming that it breaks down quickly in the soil. But courts in the US and Europe disagreed and found them guilty of false advertising. In fact, Monsantoâ€™s own test data revealed that only 2% of the product broke down after 28 days. Whether glyphosate degrades in weeks, months, or years varies widely due to factors in the soil, including pH, clay , types of minerals, residues from Roundup Ready crops, and the presence of the specialized enzymes needed to break down the herbicide molecule. In some conditions, glyphosate can grab hold of soil nutrients and remain stable for long periods. One study showed that it took up to 22 years for glyphosate to degrade only half its volume! Farmers are finding that crops planted in years after Roundup is applied suffer from weakened defenses and increased soilborne diseases. The situation is getting worse for many reasons: The glyphosate concentration in the soil builds up season after season with each subsequent application. Glyphosate can also accumulate for 6-8 years inside perennial plants like alfalfa, which get sprayed over and over. Glyphosate on the crops fed to animals is not broken down and is found in high concentration in manures. Anyway the point of all this is that each genetic modification needs to be examined individually. We need long term studies of their effects, not only obvious like deaths, but subtle like learning disabilities (which are being linked to RoundUp). We cannot take the word of large corporations who profit from them. I am not blanket opposed to GMO, but I think many of the ways it is currently being used, especially RoundUp ready, are very harmful. Actually the FDA regulates all food sources including GMO. So, it is well-tested and regulated, probably more so than traditionally grown foods. The roundup ready weeds developed from natural selection. Round up killed off the non-resistant weeds and what remained were the strongest and the fittest and over time became roundup-ready too, naturally. Many of the anti-GMO claims are the ones that are not scientific. They often make claims based on fallacious logic. Faulty cause-effect is common. It is hard to separate out variables when making a claim. Was it the gene modification that caused the problem or something else like delayed child bearing, lack of exercise, too much radiation absorbed from the computer screens, poor dietary choices- eating a lot of processed foods, the deterioration of the ozone layer, air pollution, or one of many other variables that have not been filtered out? Billions of people have been eating GMO foods from a primary or secondary source. If the claims of how bad GMO were really true, there have been billions of experiments that has spanned at least three generations by now and there should be more evidence for their claims, but most only have questions and again, without taking into account other variables which might be culpable, it really isn't good science. Rainbow, two out of three sites you linked to are dubious. They are not authoritative sources of information. They are textbook examples of the kinds of parasitic sites I discussed in my post that are hijacking the GMO conversation for profit. I am friends with and acquainted with a few of the people who produce sites like those and trust me, they are cynically trading on your outrage. It's a marketing thing. Please, if we are going to continue this discussion, link out to authoritative sources of information, not so-called activist sites promoting an agenda that are actually for-profit sites that are parasites trading on your outrage. My post is reproduced below. To start with, I never said one thing about any impacts of eating GMO crops. What I was talking about was specifically RoundUp ready crops and the environmental impacts of using all that RoundUp, which is of course the point of growing RoundUp ready. And yes of course, the super weeds are becoming resistant through natural selection. But we are imposing the conditions for that selection, by repeated spraying of square miles with RoundUp. If you want a pesticide to continue working and not breed pests (weeds, insects, etc) resistant to it, you would use it selectively, only in the areas where the problem is worst, in rotation with different herbicides, different methods. You would leave an area untouched, where non-resistant individuals can survive, so that the whole population doesn't become resistant. And weeds can't become resistant to mulch or hoeing. Somehow it is ok to blindly trust research that is bought and paid for by the companies making billions of dollars profiting off of this stuff, but not ok to look at any alternative sources of information. Look it up for yourself. The truth is out there! Somehow it is ok to blindly trust research that is bought and paid for by the companies making billions of dollars profiting off of this stuff, but not ok to look at any alternative sources of information. I addressed that in my first post but edited it out. I acknowledged that the scientific research is carried out by scientists employed by academic agricultural departments that have received money from various deep pocket corporations, sometimes including Monsanto. The anti-GMO crowd says that is biased. I acknowledged that it's within the bounds of possibility that the scientists may have been indirectly biased because a fraction of their department funding comes from Monsanto. But... how do you think those scientists would feel to have their peer reviewed work called biased? Science is about results that can be reproduced. I can acknowledge that there is a possibility that they were indirectly biased by a donation to their department. Anything is possible. Now here's where the anti-GMO thing gets strange. The same anti-GMO people that say Science is biased point to research conducted by scientists who are self-described anti-GMO activists themselves. Suddenly bias does not matter because the end justifies the means. Honestly, I'm appealing to your common sense, how scientific is it to cite research conducted by activists that are already convinced and prejudiced toward a specific outcome? Those "alternative" sites that are fanning anti-GMO rhetoric are the flip side of the conservative sites that are banging the drum against global warming. Same exact coin. Some are literally making things up out of whole cloth in addition to citing blatantly biased "research" because there is a lot of money to be made from selling advertising and selling non-gmo seeds from their websites. It's an online marketing strategy. It's called selling to a pre-sold audience, and this is how you are manipulated by those marketers: They attract an anti-GMO crowd that is predisposed to buy non-GMO seeds then they promote non-GMO seeds and advertising on the site. These alternative sources of information are a shady business profiting off the good intentions and willingness to suspend disbelief, just like the sites that profit off of promoting anti-global warming rhetoric. I have literally gone out to dinner with some of these people. They're nice regular people. They don't believe what they publish on their sites but feel that if people want to believe it then they'll sell them what they want to buy. They're just jumping on the bandwagon and making a buck. They also promote diets, creams, ufo e-books about the "grays" who are spying on humans, sell circuit boards to place on your cell phone so they don't give you radiation cancer and on, and on, and on. My personal ethics aren't so elastic. I could never feel comfortable selling snake oil. I know people who literally make millions of dollars per month selling a variety of snake oil. But I'd rather live with a clean conscience than earn my daily bread in that manner. So I will ask yet again, in case my previous pleas went unread: If you link to a source please make sure it's an authoritative source, like a .edu, a news site, etc. No .info sites, no hyphenated domains, no sites that simultaneously promote herbal snake oil for staying young, etc. Those sites are not alternative sources of information. They are marketing to you. Abuse of anything always has consequences. Roundup ready plants were developed by Monsanto to make money. They do not deny that. It was a boon to farmers when it first came out because it saved the farmers millions of dollars they would otherwise have to spend on labor to weed the fields. At that time it was claimed that roundup deteriorates rapidly once it hits the soil and becomes inactivated. It was sold that way. There have been reports that roundup can be detected in the air while it is being sprayed, but that was spraying done on commercial farms while they were actively spraying. As far as I know there have not been any science that says that round up persists in the air for a substantial period of time. Resistance is not a new thing it is as old as time. All organisms basically adapt or die, that is what evolution is all about. Penicillin was a wonder drug when it first was discovered. It was the first really effective anti-biotic against a wide range of common pathogens. The death rate from infection dropped precipitously after it was put to use and Listor convinced the medical community of the importance of sanitation. Over time penicillin got prescribed for just about everything, even minor illnesses. People did not follow directions and when they felt better they would stop taking the pills, rather than taking the full course. The body is host to millions of bacteria and fungi, all living on our skin, mouths, and guts. They are normally kept in balance by competition from each other and we don't notice them unless our immune system is compromised and we get sick. Then they can become a secondary source of infection. Penicillin was a broad sprectrum anti-biotic and it killed everything good, bad, and neutral indescriminately. Those bacteria that survived over time became resistant and penicillin no longer killed them. Some people became allergic from exposure to the proteins in penicillin and developed allergies where they could not take it. Today penicillin is rarely prescribed and new generations of anti-biotics are constantly being developed as the bacteria become more resistant. If you want to be concerned about something, be concerned about all of the anti-bacterial, wipes, washes, and hand soaps. We are likely creating more super bugs through their use. Eventually Round up will go the way of penicillin, and be replaced, but would the replacement be any better? I do agree that a lot of the problem with resistance is the over use of the product. I don't think it is a bad product, there certainly are worse things I have been told to use like vinegar, gasoline, and salt, all of these are more persistent and definitely bad for the soil in the long run. At least with regular Round Up, it does not last that long. Round Up binds tightly to the soil and will not easily become unbound, and it is eventually eaten up by bacteria in the soil which can take up to six months. But because of the inactivation when it binds to the soil, I can replant in a week after using regular Round up. I cannot say that for some of the other weed killers, or special RoundUp formulations that have been designed to persist for a long time. Glyphosate-based herbicides all work on the same biochemical principle -- they inhibit a specific enzyme that plants need in order to grow. The specific enzyme is called EPSP synthase. Without that enzyme, plants are unable to produce other proteins essential to growth, so they yellow and die over the course of several days or weeks. A majority of plants use this same enzyme, so almost all plants succumb to Roundup. The main ingredient glyphosate has low toxicity to animals. But there may be other chemicals in the herbicide with RoundUp that have potential toxic effects. That is why everyone who uses any product should read the label and follow the instructions and precautions. I try to avoid using any chemicals in the garden as much as possible. I rarely use Round Up, and only after everything else that is practical for me to try has failed. Academic departments are one thing. I think there can be subtle influences, but there are also controls for them. But there's lots of "research" that comes more directly from the companies themselves (they are allowed to do their own research to prove their products safe) or from think tanks that are completely controlled by them. Remember for how long scientists reassured us that cigarettes were safe or at least there was no way to prove that they were harmful? RE "Monsanto used to boast that Roundup is biodegradable, claiming that it breaks down quickly in the soil. But courts in the US and Europe disagreed and found them guilty of false advertising" : France's highest court has ruled that US agrochemical giant Monsanto had not told the truth about the safety of its best-selling weed-killer, Roundup. The court confirmed an earlier judgment that Monsanto had falsely advertised its herbicide as "biodegradable" and claimed it "left the soil clean". RE: "glyphosate works by by depriving plants of vital minerals necessary for healthy plant function": ]. The former Stauffer Chemical Company (Westport, CT, USA) initially obtained a patent for aminophosphonic acid as a chelating agent, wetting agent and biologically active compound . Glyphosate was initially used as a descaling agent to clean out calcium and other mineral deposits in pipes and boilers of residential and commercial hot water systems. Descaling agents are effective metal binders, which grab on to Ca, Mg, etc. ions and make the metal water soluble and easily removable. Later, the Monsanto Company has acquired the chemical from Stauffer and obtained a patent for aminophosphonate for its herbicidal properties. [since it binds to these minerals so tightly, it deprives the plants of them] FROM: Glyphosate, Hard Water and Nephrotoxic Metals: Are They the Culprits Behind the Epidemic of Chronic Kidney Disease of Unknown Etiology in Sri Lanka? International Journal of Environmental Research & Public Health. Feb 2014; 11(2): 2125â€“2147. In US National Library of Medicine, Institutes of Health. This same article notes that the biodegradability of glyphosate is heavily influenced by the presence of hard water. Since the glyphosate binds so tightly to minerals, it forms a stable complex with metal ions. In this form However, the absorption of chelating agents or metals has been shown to decrease the biodegradability of glyphosate (Figure 3) [23,27,33,34,35]. Radioactive 14C-glyphosate studies have shown that half-life can increase up to 7 years  or even up to 22 years  in the soil. Andrea MM, Peres TB, Luchini LC, Pettinelli Junior A. Impact of long-term pesticide application on some soil biological parameters. Journal of Environmental Science and Health B 2000;35:297-307.
and lots more. Webmaster, you have been reading my posts for about six (!) years now. You know I am not a fear monger, and I have a high regard for science and evidence. But I do try to be a voice for the environment and against the widespread environmental destruction we are blindly practicing these days. Thank you Rainbow, good information. And yes, I am well aware that you have a scientific background, which is why I appealed to you with the information about some of those unscientific sites, in the hopes that I could communicate that those sites are not necessarily authoritative but have ulterior motives. I'm only asking that if another website is cited to please cite an authoritative site, and I am giving all of you information that I hope you will use for your benefit in order to be able to discern a legit site from one that is not authoritative. OK let's set aside Monsanto for a second, because Monstanto is really a whole slew of problems, and it's hard to get down to the GMO/NON-GMO questions I am asking. This is one of those topics that creates more questions possibly than answers, but I am going to ask this stuff anyway. 1. Is there a name for the process of "Artificial Selection" when engineering plants? 2. Are those plants "bad for you"? I can't understand how they would be bad, unless the plant was just bad for you from the beginning. 3. Is there a name for the process of "gene splicing" when the scientist actually inserts genetic code into the plant DNA to produce a trait? 4. Why is the second way bad for you? 5. Why is it impossible to replicate that splice through artificial selection? my web searching is really not answering these questions. I get a lot of answers that are slanted and I'm still not understanding this completely, but I am going to start with those questions I just asked, because they can answer other ones I have, but I don't want to ask them all at once, because they will get lost. hope you had a great x-mas everyone! Voices30 wrote: OK let's set aside Monsanto for a second, because Monstanto is really a whole slew of problems, and it's hard to get down to the GMO/NON-GMO questions I am asking. This is one of those topics that creates more questions possibly than answers, but I am going to ask this stuff anyway. I'm not sure what you mean by "artificial selection" in question 1, unless it is the process people have always used in breeding/ hybridizing plants. That is how we got corn from maize which had one inch long cobs. If this is what you mean, nothing is wrong with it, because you are not tampering with the plant's genetic material, you are just creating the conditions for natural selection to work in the direction you want it to. If there were no people involved, but something in the environment favored the survival of plants with bigger, more nutritious cobs, the same exact thing would happen. Genetic modification is what we are calling the gene splicing method in question 3. It is not necessarily "bad" for you. That is why I said you have to ask the question what modification for what purpose. I just think we don't necessarily know all the consequences and we have a long history of finding out later the unintended consequences of something we have done. And in the RoundUp Ready modification case, the point is not that the corn that is grown that way, with that gene inserted is bad for you to eat. Probably not. But all that RoundUp that is then used is bad for the environment and may be bad for you. You cannot replicate that by "artificial selection" / hybridizing, because that gene is not in the plant. In hybridizing, the gene already exists. Sexual reproduction, which corn uses too, jumbles up the genes. It's why you don't look exactly like your brother (unless you are identical twins), because even though you each got half your genes from each parent and the parents were the same, you didn't get the same ones. So in plant reproduction and hybridizing, you can come up with more "favorable" combinations. Then the humans can select those and perpetuate them and continue the process. Sometimes mutation can happen in there also, but mutation being random, it generally is not favorable. So in hybridizing you can only improve on what the plant can already do. In the laboratory, they can insert any gene. We now have glow in the dark goldfish, pigs, and cats, because the scientists inserted phosphorescence genes from jellyfish into the goldfish and other creatures (also sheep I think). You could breed goldfish from now to eternity and never get glow in the dark ones, because it doesn't exist in their DNA. So note again, I never said it is bad to eat GMO crops. I only said the question is not entirely settled and I would like to know what I am eating and have a choice. And that depending on what modification is done, for what purpose, it may have unintended consequences, like all the excess herbicidal poisons that are now being used, because RoundUp ready crops led us to vast over use of RoundUp and breeding lots of super-weeds. Voices, this video answers some of your questions. It is the most neutral and simple video I could find. It does not tell the whole story. The reason that fish genes can be put in tomatoes, and jellyfish genes in pigs is because on a molecular level, all genes are made up of the same chemicals. It is the order they are in that determines whether they have wings or hair. The video does not go into the testing and vetting process. If Aspirin had to go through as rigorous a process of testing, it would probably never have passed. It was only approved because it is on the GRAS list. Just because something is new and innovative, does not make it bad. Just as because a lot of people believe something doesn't make it true, otherwise we would still think we are living on a world that was flat and that the earth was the center of the universe. It took thousands of years, the persecution of Galileo for daring to say that the earth was not the center of the universe, and science to prove he was right. It is true that if you are looking to find something, there is probably a test or experiment you could do to say what you want to hear. But isn't that like the blind men and the elephant? The sum of the parts make up the whole, but each part is only part of the answer and not descriptive of the whole thing.